For Jennifer Nichole Wells’ Weekly Photo Challenge–the Seasons, this week’s theme is COLD. Is it cold where you are? We are expecting temperatures in the upper 80s by the end of this week, after unseasonably cooler days with clouds the last couple of weeks. 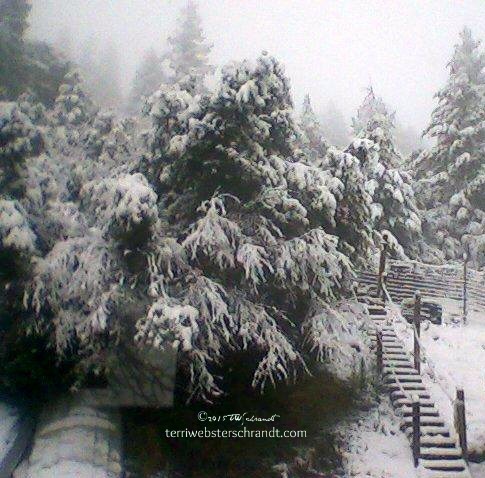 This photo shows a cold snowstorm that hit my dad’s place up in the foothills of the Sierra Nevada’s four years ago. If that doesn’t make you say “brrrr,” then here’s a nice bowl of dry ice for you. Some frozen dinners I ordered came packed in it and my hubbie thought it would be fun to play with the dry ice. If you feel hot, let these two photos cool you down. If you are feeling cold…I got nothin’…at least in this post. At any time, you can join Jennifer Nichole Wells’ Weekly Photo Challenge–the Seasons. That is hilarious! We are just never satisfied are we? It is hot here and we could have used a ton of snow! I’m just up the road from you in Sacramento. Closest snow is in Tahoe earlier this year. Ah, these pics showcase cold so well! And the dry ice looks so interesting! What kind of meal did you order? Surprisingly I had very few cold photos. I bought a frozen order of nutrisystem products last year and my hubbie thought the dry ice was cool. 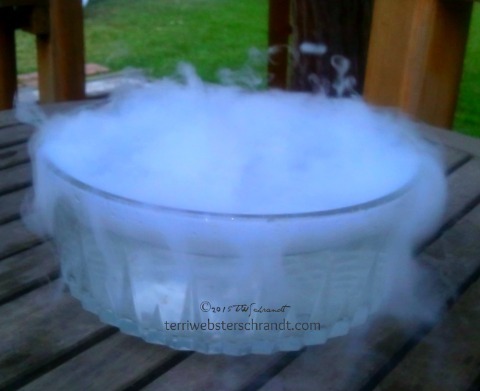 I’ve never seen dry ice in “real life ” I’d be mesmerized by it! Ah indeed it is dangerously cold! But it does make that cool smoky effect on front porches trick or treating!!! These are lovely! That tree si beautiful, and nice idea getting the shot of the dry ice. Thanks for sharing. Definitely cool pictures! Great take on the challenge. .
Oh, now I see it. I forgot, I have to comment first. Cool picture! Sorry but I don’t see a picture. LOL! Is that the “picture” of dry ice – nothing? I wonder why the photos don’t load for you? I haven’t heard of this issue with others who have viewed. Sorry for the inconvenience!! I use an iPad, and that could be why. It hasn’t always been this way. Love the picture of the dry Ice. It’s super cool! (Pun intended 🙂 ) I’m in central Illinois right now and it’s been so humid while we’ve been here. The cold actually looks a bit welcoming (though I’m sure the dry ice would be quite unpleasant).